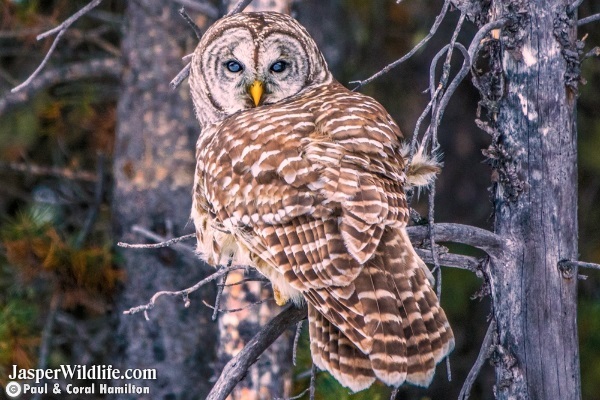 The Barred Owl is also known as the hoot owl and is a true owl native to North America. Barred Owl adults are quite large with brown to grey with "barring" on the chest. Barred owls have expanded their original range from just eastern to range in the west coast of the United States and Canada today. Mature forests are the preferred habitat, but Barred owls can also found in open woodland areas. Their Barred owls' diet consists mainly of small mammals, but they are known to prey upon small animals such as birds, reptiles, and amphibians as well.